Scale, if necessary, clean and prepare fish for cooking. Season to taste with salt and allow fish to reach room temperature for an hour. Roll in flour and fry in hot oil until golden brown. 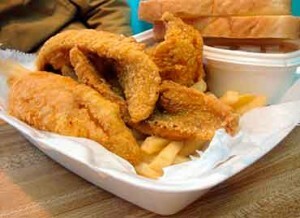 Drain fried fish in a wire basket or on a plate covered with absorbent paper. Serve very hot as main course or cool for use as an appetizer.